Feature | Telly Talks - Progressive to Regressive to Progressive..?? If one had to take a critical look back at the era of DoorDrashan as the most popular medium of information and entertainment, an avid television viewer would say that television serials of that era were quite 'progressive' in nature. TV shows like Buniyad placed the women center-stage and depicted them in positive light. Cut-to the new millennium, and things changed drastically. Industrial development, booming economy and growing infrastructural facilities like malls and multiplexes; all seemed personifications of 'progress'. But things were running the other direction for television! While multiplexes in a large way changed the kind of films India produced along with the audiences, television chose to go the 'regressive' way. Women characters on TV became weaker, stuck in the all-so-over powering taboo struck society and 'meaner'; confined merely to play either 'the saas', 'the bahu' or 'the vamp'! 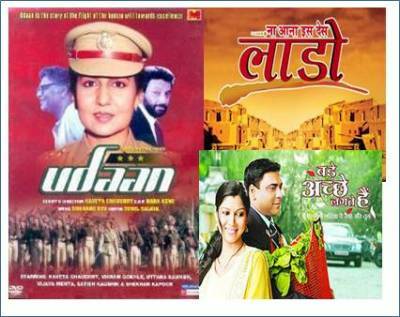 The 'saas-bahu' era had taken the television by storm, contradictory to what is known as television's bigger version - cinema. Cinema during this time had evolved. Films made spoke about independence and individuality. Interestingly, while the 'saas - bahu' shows like Kyunki Saas Bhi Kabhi Bahu Thi and Kahaani Ghar Ghar Ki ruled the TRP charts all through 2007 with average TVR as 9.35 and 9.45 respectively; in the following years the channels witnessed the numbers dwindling down the scale and there came a point where these 'blockbuster shows' as one would call vanished from not only the 'Top 10 programs list', but also from the charts as well. On the flip-side shows like Bade Acche Lagte Hai and Afsar Bitiya recorded good TVR in 2011. And just like changing weather conditions, the trend on TV serials seems to change again. While 'saas - bahu' serials have taken a back seat, television now has a 'Bade Acche Lagte Hai', 'Maryada - Lekin Kab Tak', Punar Vivah, Kya Hua Tera Vada, Hitler Didi and Afsar Bitiya to cater to the continually altering taste's of its audiences. Not surprisingly, these shows are well accepted and appreciated by the audiences, and are thus ruling the roost. Adgully exclusively caught up with a few industry experts to know more about this interesting shift in trend. Vivek Bahl, Chief Content Officer, Turner International India Ltd said, "Well, as Indian viewers become more diverse & television viewership multiplies, we are sure to see newer themes emerge. While there will always be 'mass-oriented' shows targeting the maximum number of people in GECs, which might tend to go for more universally accepted themes and simultaneously, a second line of shows targeting slightly more niche viewers is emerging. The cause is that even those viewers are in relevant enough numbers to give certain ratings." "As advertising revenues grow, & other streams of revenues open up to place their monies behind shows targeting niche viewers... this trend of a wider range of concepts across platforms is just likely to gather steam... with more niche content even in fiction with lesser TRP numbers. That said, the shows targeting the biggest numbers, will always exist on the bigger GEC channels, as the huge numbers of viewers for these are going nowhere...!," he added. Whereas commenting on whether there has been a shift, Akash Chawla, Head-Marketing, National Channels, ZEE said, "In terms of what's relatable and addressing real world issues, Zee TV launched Pavitra Rishta in 2008 depicting the story of middle 'class family in Mumbai and it was a huge success being the No 1 show on Indian television for the longest time. Many channels replicated that trend that we had actually started many years ago. Another example is our show, Tara in which besides the content being differentiated, showcased costumes worn in that period and it all became such a trend with audiences aping Tara outfits. And here too like many of our trendsetting shows from Zee TV, other channels followed our success stories. We have always been catalysts in the content revolution in India." Commenting on the shift in the trend, Anooj Kapoor, executive VP and Business Head, SabTV said, "I would say that we are set, because for the first time three and half year ago when we started re-positioning, we started with positivity of joint family system and first time we used female protagonists who were not crying of feeling sorry for life but had a very positive and light hearted cheerful outlook towards life and fighting back to problem in positive light hearted manner. By using that we view 500percent in 3 years and inspired other channels too. And many channels started following us." When asked, are the channels targeting a new set of audiences with the newer concepts, Chawla said, "There were many regions in India that did not have Cable & Satellite connectivity unlike how widespread the connectivity is today due to digital penetration increasing so rapidly. So firstly we have much larger penetration today. Secondly, with measurement tools now adding smaller towns in its radar, the availability of channels in small, medium, large towns, cities and metros respectively is huge. Thirdly, if one compares GEC television viewing with respect to the male TG, it's much higher in the last three years so we're also getting newer audiences." On further explanation, Chawla added, "We are not necessarily looking at newer audiences but we are looking at evolving tastes and habits among them and our content tries to change to meet these inherent evolving beliefs and truths." Also sharing whether, it is a bit of risk to launch shows with a little 'hatke' concepts Chawla explained, "Yes, it is absolutely risky to launch any concept not just one with a hatke concept nowadays due to increased fragmentation. But ZeeTV's success lies in launching differentiated concepts with shows like Saanp Seedi, Tara, Gubbare, short stories like Rishtey, Saat Phere, Betiyan bringing the girl child to the forefront, Agle Janam Mohe Bitiyan Hi Kjo, Pavitra Rishta, Hitler Didi, Afsar Bitiyan and now our upcoming show, Punarvivaah." Also they have the talented common men/women make our superstars in Sa Re Ga Ma Pa and Dance India Dance all highlights how their success is built on the premise of taking risks. Aapki Antara on Zee TV is also one show that I believe was the most risky and differentiated show on television. Some concepts may go wrong but the culture of fostering new concepts is ingrained in the Zee DNA. Anooj Kapoor says, "As a person who is experimenting with new concepts in his shows, It's always a risk but I believe in greater the risk, greater the return. I believe that we must innovate and produce originality. If we copy anybody, consumers will get in certain fatigue after sometime. Creator of television content has loads of things and ideas to work on so why to restrict yourself to copy a certain genre when u can experiment with new things."